1) Protection of computer and attached USB devices - GREAT for LAB & Field use! Just plug your USB device into the USB2ISO's connector and then plug the USB2ISO into a USB port of a HUB or PC. To avoid excessive force on the USB port of the HUB or PC, you may put the USB cable supplied in between. The PC and your USB device now have no electrical connection but can still talk to each other. 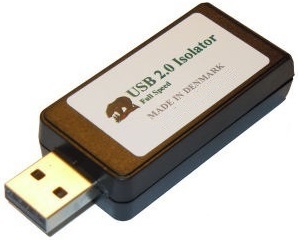 The USB2ISO module also transfers power from the PC to your USB device with no electrical connection. Your USB device is now protected and can be attached to other ground potentials without any ground loops that could destroy your computer, USB device and other attached electronic devices. Two isolators provides sufficient power to VT DSO-2A10E, 2A20E. A USB cable with two heads on the PC side should be used in this case. (1) The second-generation of VT DSOs support USB2.0 high speed (480MBps) if connected to a USB 2.0 port. This is preferrable as it is much faster than USB full speed (12MBps), resulting in much faster screen refresh rates, and much higher sustainable sampling rates under the streaming mode. However, it should be noted that for many computers (typically desktop PCs or laptop PCs with a built-in AC power supply adapter), the ground line of the oscilloscope probe is connected to the ground of the USB port which is connected to the mains earth through the computer's power cord. This is not a problem if the circuit under test is floating (i.e. isolated from earth). Otherwise, you MUST make sure that the ground lead of the probe is connected to a point on the circuit that is also at earth potential, or else a USB isolator should be used. (2) There are some USB oscilloscopes in the market that claim to have an isolated USB port. It maybe good to have an integrated design, however, they can only support USB full speed (as there is no USB high speed isolator in the market) and thus suffer from low communication data rate. This is a drawback when USB isolation is not required. 1. How to make floating or isolated measurements and break the ground loop with a USB oscilloscope?